Léa-Catherine Szacka presents her PhD dissertation Exhibiting the Postmodern: Three Narratives for a History of the 1980 Venice Architecture Biennale. The 1980 Venice Architecture Biennale ‘The Presence of the Past’was a multi-faceted display of international contemporary architecture with an Italo-American twist. 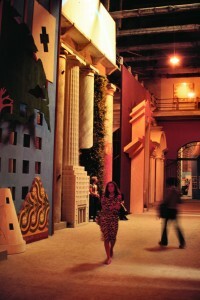 Successfully playing on postmodern form and content, this exhibition marked a new relation between the worlds of art and architecture, arising from the crisis that had touched Italian cultural institutions in 1968, and the consequent transformation of the architectural product as end object. After this exhibition, postmodernism became a galvanic term in relation to architecture. Looking at the question of architectural exhibitions in a postmodern context (1968 to 1988), the research seeks to unravel three very diverse yet interwoven narratives relating to the 1980 Venice Architecture Biennale. It draws upon recent literature on architectural exhibitions, newly accessible archival material, and original oral history accounts, and looks at exhibition techniques and exhibition spaces, institutional changes, and exhibitions as a site of confrontation between advocates of modern and postmodern architecture. It argues that the 1980 Venice Architecture Biennale was a hinge in three ways: first, in the development of architectural exhibitions as a ‘genre’ of cultural manifestations, second, in the history of the Venice Biennale, and third, in the history of postmodernism. As the first detailed historical account of the 1980 Venice Architecture Biennale, this research sheds new light on the history of an event that, despite its transient nature, has continued to remain vividly present in the collective memory. Originally posted May 17, 2010. Latest revision May 27, 2014.